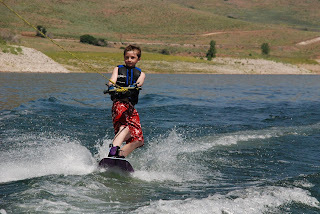 Deer Creek, Wakeboarding, Waterski, Wake Surf, Watersports charters, Off Site Boat Rentals. Deer Creek is a great place for a quick get away from Utah County or Salt Lake. Let TK Water sports outfit you for the ultimate dream Watersports vacation. Rent an RV, Travel Trailer, Motor Home add a boat or wave runner package and receive a discount on one of our popular package combinations. Deer Creek Reservoir is located just minutes up Provo Canyon and/or just southwest of Heber UT. The reservoir lies in the southwest corner of beautiful Heber Valley provides some of Utah's finest year-round fishing Facilities include a concrete boat launching ramp, 35-unit campground with modern rest rooms and showers, two group-use areas, sewage disposal and fish cleaning stations For those who love Skiing and wakeboarding early morning or early evening are your best bets for good water. Deer Creek is infamous for its afternoon winds; you could almost set a clock to them. They usually start around one and last through about four. This is a great time to break out those tubes, water wienies, and jet ski’s, TK Watersports can set you up in a RV boat combo package that can include the water toys need for that perfect weekend at Deer creek.